The world around us is the world of the Internet of Things. Different devices communicate among themselves, forming networks, which are combined with each other and with the Internet. IoT is almost in all spheres of our life, and now it’s becoming popular in smart home systems, medicine, and machinery. The fields where we can use it is growing rapidly. Many companies are interested in this technology and are already seriously engaged in its development. We talk about such giants as Google, Samsung, Apple, LG, Intel, Qualcomm and many others. According to the research of International Data Corporation (IDC), a market transformation will increase expenses for the IoT segment from 1.9 trillion in 2013 to 7.1 trillion in 2020. And according to the forecast of Gartner analysts, by 2020 the number of connected devices will be almost 10 billion. 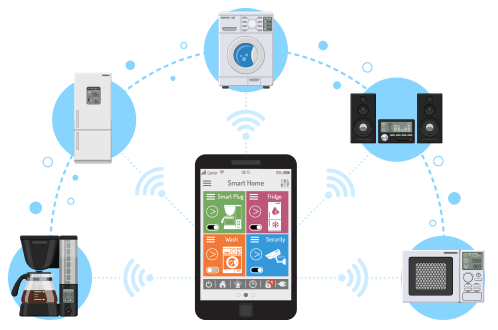 The growth of the IoT-device market will create a situation when the number of connected Internet of Things devices will exceed the number of connected mobile phones in 2018. These statistics were presented by Ericsson. Now we have smart cars, houses, appliances, toothbrushes, watches and even forks. Mobile applications for smartphones serve as a link between users and their devices because through them, we can manage the Internet of Things devices. The IoT development, and especially the creation of mobile applications, carries a huge number of opportunities and benefits. That’s why IoT technology has become one of the priority areas of mobile application development in recent years. Building an application for the Internet of Things is quite a difficult process which requires a lot of time and resources. You have to plan your budget before ordering it. What things should you keep in mind? What aspects influence the IoT application development costs? Let’s review how much the average app can cost. i) What kind of app you need and how complex it is. The simpler the app, the less money it costs. ii) The amount of time required to develop an app. This point directly depends on the type and complexity. iii) The number of team members you are cooperating with. iv) The hourly rates of the programmers involved. It depends on the region they live in. Now let’s see each factor in details. Before starting, the team of developers must attentively analyze the app’s goals and how it will be positioning. Based on the list of features, they will be able to tell the final price. The more features they will have to implement, the higher the cost will be. The process of IoT application development consists of three main stages: designing, developing, and post-development. Each step is mandatory, and each team must follow them to achieve the greatest results. Given amounts are average and may vary depending on the app. On the developing stage, the team creates the app according to the design. The average time reaches 400-1000+ hours. Post-development includes the testing and bug fixes. This stage may take the development team 35 to 170 hours. Depending on the app, the development team may include a different amount of members. A simple app will require fewer team members, while complex projects will require a bigger team. However, the extended team for a complex IoT development project will include back-end developers, business analysts, panel designers, and administrators. Again, this is an average and may vary project by project. i) Eastern Europe — $30-50 per hour. ii) North America — $50-150 per hour. iii) Western Europe — $65-130 per hour. iv) South East Asia — $20-50 per hour. Remember that the rate may vary and also depend on the programming language and the experience in IoT development. We discussed the factors which may influence the IoT application development cost. Here are some average prices depending on the app type. i) Simple app — $1,000-$4,000 — you will have to provide all the necessary content, clear instructions, and similar apps. If you are good with Photoshop, you may also provide the graphic design. Any additional components will cost more. ii) Native app — $8,000-$50,000 — again, you will have to provide absolutely all the content. The development includes architecting and usability creation. Such IoT solutions will require a lot of front-end work. iii) Game — $10,000-$250,000 — the hardest projects. Most modern games are far more than $100,000 dollars as they require a lot of effort of highly professional specialists. The more tricky elements, the higher the efforts. A) In-app payments — $1,000-$3,000 — the user may get other elements or even buy the whole app. The price depends on the payment system, location in the app or on the server, as well as complexity. B) Web services — $1,000-$3,000 — the ability to create the remote access point and update the app content with XML instead of the code changing. Before developing, contact the engineer to discuss how deep you would like to implement it — it will save a lot of your effort. C) API integration — $500-$1,500 — with APIs, you will be able to integrate a lot of third party services like social networks, email, photo stocks, and other platforms and apps. IoT application development is a very serious process and very often requires a lot of efforts. Now you know the average budget, and it will really help you to create a really useful IoT solution.